Did you know that drinking just one 12-ounce sweetened soda a day (at 138 calories per can) can raise your risk of developing type 2 diabetes by 22 percent? Diet soda isn't much better: A study found that even one zero-calorie pop a day was linked to metabolic syndrome, which raises your risk for heart disease. 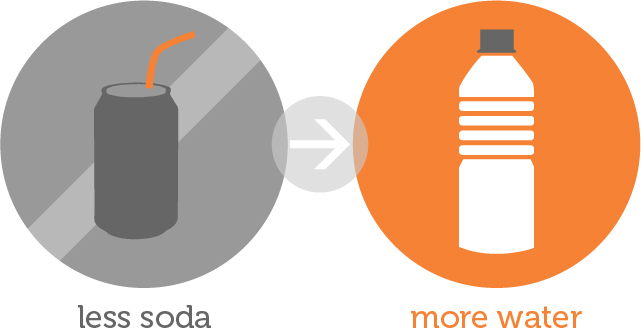 If you love your soda and drink a lot of it, start slowly and simply replace one can a day with a tall glass of water or, if you don't like the flavor of water, try watered-down juice (juice on its own has lots of calories too) or sports drink, or add a splash of juice to a glass of seltzer. Tea and coffee (iced or hot, without added cream or full-fat milk) also count. Staying hydrated (meaning giving your body enough water/fluid to function properly) is an important part of your workout plan. If you become dehydrated (meaning you don't have enough fluids), exercising will be a lot harder to do. If you like to work out in the mornings, consider drinking some water before you get started, since your body becomes dehydrated while you're asleep. This is one of 10 swaps you can make that will get your eating on track and give you enough energy to fuel your workouts. If you make all 10 swaps, you'll be well on your way to a healthy diet. The information on this site and related sites and platforms, such as Facebook and Twitter, should not be treated as medical advice and should not be used as a substitute for the advice, treatment, evaluation, diagnosis, or care of a qualified healthcare professional. Please see your physician if you have questions or concerns about your health.